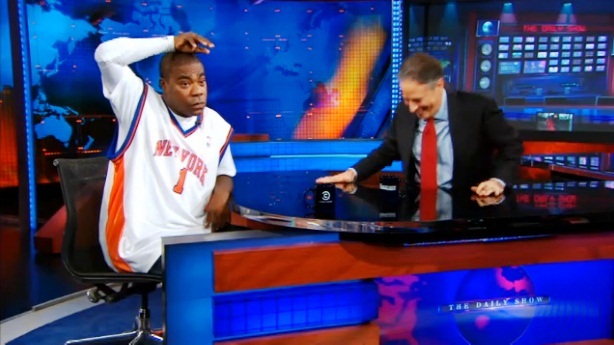 *Tracy Morgan had some fun with potential presidential candidate Donald Trump’s campaign to convince everyone that President Barack Obama might not have been born in the US. During an appearance on “The Daily Show,” Morgan challenged Trump’s assertions by saying that he, in fact, has a copy of the president’s birth certificate. Addressing Trumps admission that he hired private detectives to go to Hawaii and poke around for the truth, Morgan said he has enlisted his own investigators, who have uncovered a secret love child from the mogul’s past. LoL! Tracy is a fool. Ha, Ha! the voice, his demeanor, cracks me the hell up!